*Whether you’re playing or just want to join us for the fun, music, food, company and support Jack's Foundation, after-party BBQ wristbands can be purchased on this registration form in advance for $35. The bands give all access to BBQ, beer/cocktails, and live music. *Registration Deadline: July 1st, 2019! The Men’s Jamboree Logistics: Each team will play at least 3 games followed by playoffs and finals. Games will be played on Turf and grass fields with certified officials. Beer/cocktails, BBQ and band will begin at 5:00pm. Facilities will be available to shower and change. Ensure early registration and roster details to secure a Jack Jam team shirt for each player from Atlantic Sportswear. Each registered player will receive a unique Jack Jam shooter shirt in their team's respective school colors to wear throughout the tournament and take home. * To complete your registration, please enter the appropriate amount in the "USD" box to the right of "Registration Payment via Square" provided at the bottom of the form. You will then complete the credit card information, sign and submit. For example, if you are registering to play as an individual ($65) and attend the BBQ ($35), please enter $100 in the box. If you are a team leader and registering your entire team for the Jamboree ($1,500) please enter $1,500. Each team member can pay individually using this form for the BBQ. Please Register me for the BBQ. *In the Registration Payment USD box below enter a payment of $35 per ticket. *If you are also registering for the lacrosse jamboree, please add the $35 to the player registration $65. 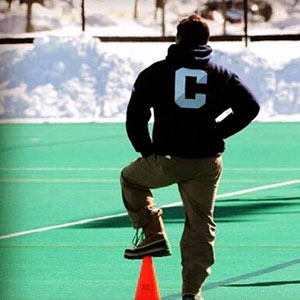 Jack Sandler was dedicated to growing the sport of lacrosse his entire life.In his time as a coach, he recruited a diverse range of lacrosse players. Jack believed all young athletes deserved an opportunity for athletic and educational excellence. If a player had lost the love of the game, they'd find it under Jack's tutelage. If they struggled to reach their potential on or off the field, Jack was there to motivate them.He humbly focused on being a well-rounded person, recognizing his strengths and seeking out opportunities to let them grow and shine. Best of all, Jack was a leader.He led his teammates, players, friends, family, and even brief acquaintances. He inspired them to try harder, learn more, and shoot for the stars. I am fully aware of and appreciate the risks, including the risk of catastrophic injury, paralysis and even death, as well as other damages and losses, associated with participation in lacrosse programming and / or a lacrosse event. I further agree, on behalf of myself, my heirs, and personal representatives, that those involved in the planning of the Jack Sandler Jamboree, Governor's Academy, and the Jack Sandler Leadership Foundation, along with the coaches, volunteers, employees, agents, officers and directors of these organizations, shall not be liable for any injury, loss of life or other loss or damage occurring as a result of the above named individual participation in lacrosse programming and / or a lacrosse event, or as a result of equipment that may have been provided to me for these activities.